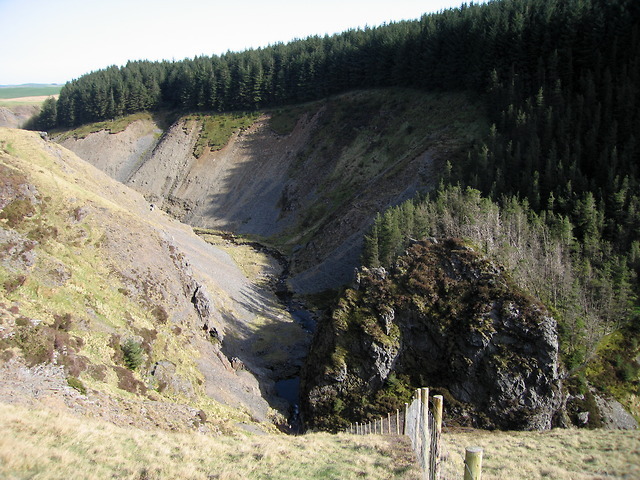 The upper Clywedog valley follows a geological fault line cutting across the Foel Fadian formation of interbedded mudstone and sandstone Link . Most of this section of the valley is very straight owing to the orientation of the fault and erosion due to the fast flowing river, but one rocky obstacle has remained around which the river bends. The sedimentary rock is very crumbly, resulting in unstable eroding slopes on both sides of the river.